Pasta, mushrooms, garlic? Check, check, check. 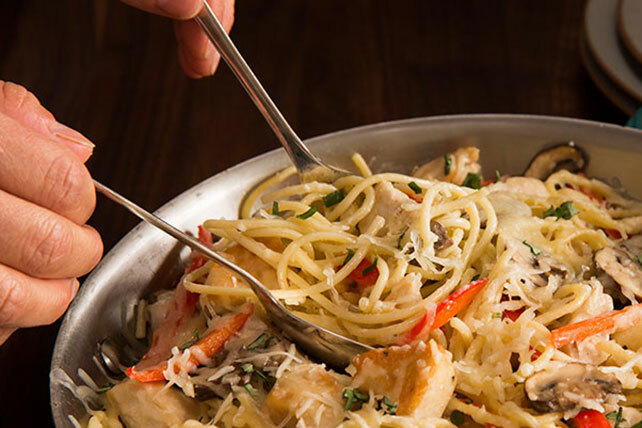 Our Chicken Tetrazzini has everything you like about the classic—all in one quick and easy weeknight dish. Cook spaghetti in large saucepan as directed on package, omitting salt. Meanwhile, cook chicken, mushrooms, peppers and garlic in large ovenproof nonstick skillet on medium heat 8 to 10 min. or until chicken is done. Remove chicken mixture from skillet; cover to keep warm. Whisk flour and milk until blended. Add to broth in same skillet; mix well. Bring to boil, whisking constantly; simmer on medium-low heat 5 min. or until thickened, stirring frequently. Remove from heat. Heat broiler. Drain spaghetti. Add to ingredients in skillet along with 3 Tbsp. Parmesan; toss to evenly coat. Top with Swiss cheese and remaining Parmesan. Broil, 4 inches from heat, 2 min. or until top is lightly browned and Swiss cheese is melted. Sprinkle with basil. If you break the spaghetti in half before cooking, it makes serving the dish easier. When a skillet dish calls for toasted nuts, there's no need to heat up the oven. Before beginning the recipe, simply toast the nuts for a few minutes in the ungreased skillet on medium heat, stirring frequently just until nuts are lightly browned. Remove nuts from skillet and continue recipe as directed. Substitute a green, orange or yellow bell pepper for the red pepper.